I last went to Latvia on a family holiday in 1995, on what we considered at the time to be quite an adventure, given that the three Baltic States - Estonia, Latvia and Lithuania - had only been independent for four years. We took our own car, sailing from Harwich to Gothenburg and from Stockholm to Tallinn and then driving from Estonia through Latvia to Lithuania and back, returning via Helsinki and Stockholm. Border crossings were quite perilous, on one occasion we were sent back to the British Embassy in Tallinn by the border officials who didn't like the documentation I had with the car. It delayed us by a few hours and earned the exasperation of the Consul, as it was quite common. Today you hardly notice the borders. So why come back? Well, Latvian Railways - Latvijas dzelzceļš or LDz - are extremely exotic to Western European eyes, Latvia having been an integral part of both the Tsarist and Soviet empires, with only a 20 year period of independence between 1920 and 1940. And unlike both Lithuania and Estonia, which have invested in some modern Western European equipment, Latvia still operates the equipment bequeathed to it on the break up of the Soviet Union, albeit with some rebuilding. 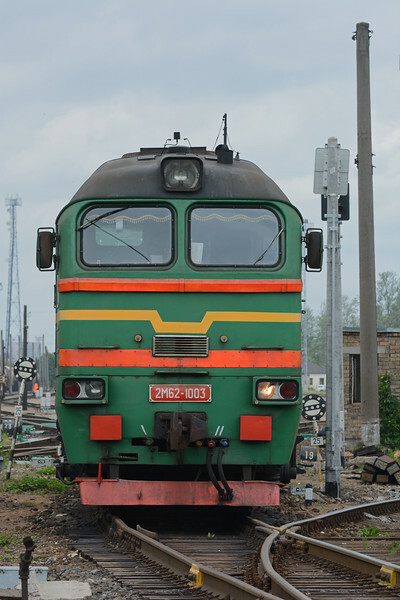 The railways are also extremely busy, Riga, and Latvia's Baltic Sea port of Ventspils, are major destinations for exports from Russia, Ukraine and Belarus. Endless trains of oil, coal, iron ore, timber and agricultural products run across the country on the final stage of their journey to the sea. Block oil trains and block coal trains are common but you also see oil tanks and coal in mixed freights too. And by and large trains are long and heavy, not to North American standards or the iron ore railways in Brasil and Australia but much longer than in Western Europe, 64 wagons was the longest I saw. The freight hotspot is Krustpils, a junction station about 140 kms SE of Riga, on the Daugava River. The two most important lines from the east, via Daugavpils and Rēzekne, and the lines from Riga and Ventspils all meet at Krustpils, action can be frenetic at times with train approaching from all points of the compass. And the trains themselves look very different, all hauled by former Soviet diesel types M62, 2M62U, 2TE10U, 2TE116 and the Chmushka, the ChME3 switcher, of which almost 7500 were built by CKD in Czechoslovakia between 1964 and 1989. I really like them, they sound marvellous.